By: Alison Cassady, Director of Domestic Energy Policy, Center for American Progress and Myriam Alexander-Kearns, Research Associate, Center for American Progress. The Clean Power Plan will expedite the deployment of renewables and cut carbon emissions and other pollutants that harm human health. On September 27, 2016, the D.C. Circuit Court of Appeals will hear oral arguments for West Virginia v. Environmental Protection Agency, a lawsuit to block implementation of the Clean Power Plan, which sets the first-ever limits on carbon pollution from the electric power sector.Leading the way in the litigation are some of the country’s biggest carbon polluters and their political allies in states across the country. The Clean Power Plan, or CPP, is a central part of the Obama administration’s plan to address the urgent threat of climate change by cutting the country’s greenhouse gas emissions 26 percent to 28 percent by 2025. 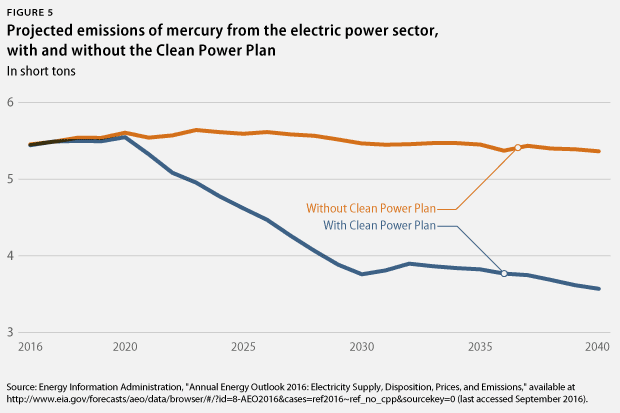 This year, the Energy Information Administration, or EIA,examined what could happen to the electricity generation mix, power plant emissions, and the climate if the CPP does not enter into force. The EIA found that the CPP speeds the deployment of renewables, shifts the electricity mix toward lower-carbon sources of energy, and cuts carbon pollution, as well as other pollutants that harm human health. This is important progress. On its own, however, the CPP will not be enough to achieve the country’s long-term goal of reducing greenhouse gas emissions at least 80 percent by 2050. The Clean Power Plan means more electricity from renewables. Under the CPP, states are required to replace traditional coal-fired power plants with modern, lower-carbon energy sources, such as solar and wind power. 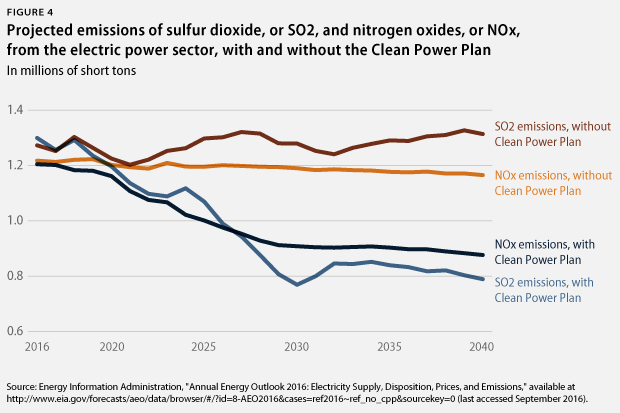 As a result, the United States will enjoy a cleaner generation mix sooner. With the CPP, electricity generation from renewables—led by wind and solar—will surpass coal generation for the first time ever by 2028. (see Figure 2) Without the CPP, the EIA does not see that happening until after 2040. 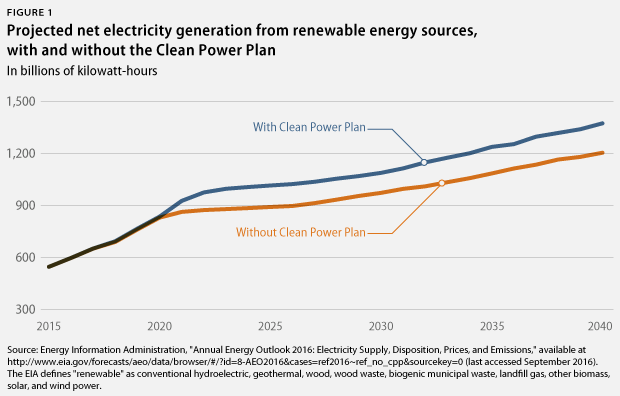 Notably, many experts argue that the EIA’s model is rather conservative in the assumptions it makes about the deployment and cost of renewable energy technology. Consequently, the EIA’s analysis could underestimate the impact of the CPP and other policies on the growth of electricity generation from renewables. 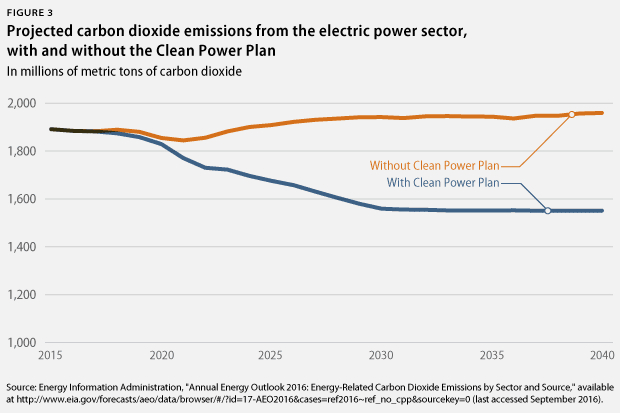 The Clean Power Plan will quicken carbon pollution reductions. 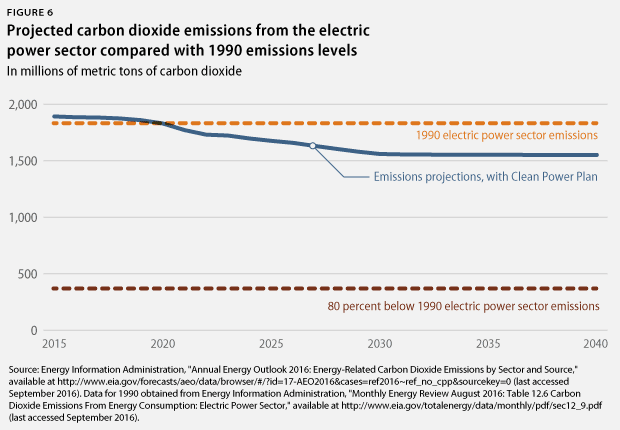 The shift toward cleaner energy sources will ensure carbon emissions from electricity generation fall instead of rise. The EIA found that the CPP will reduce carbon dioxide emissions from the electric power sector 18 percent from 2015 levels by 2030, the final year of the plan’s implementation. This is about 35 percent below 2005 levels. 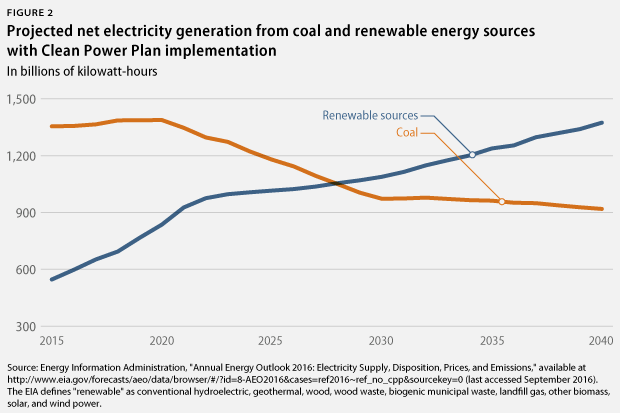 The EIA attributes these projected reductions primarily to the switch from coal to less carbon-intensive natural gas and to zero-carbon renewable sources, such as solar and wind. Energy efficiency in the residential, commercial, and industrial end-use sectors also plays a role in lowering emissions projections. The Clean Power Plan will cut pollution that harms public health. But the United States needs to do more. The CPP, while important to the U.S. strategy to mitigate climate change, is not sufficient on its own to achieve the necessary economy wide emissions reductions to avert the worst impacts of climate change. The United States must—and can—do more. States should move forward with implementing the CPP, even though the Supreme Courtissued a stay pending court review. Continued delay is not compatible with the urgency needed to cut carbon emissions. At the same time, state and federal policymakers need to demonstrate leadership and enact additional measures to decarbonize the U.S. economy by transitioning quickly to cleaner energy sources.